We enjoy the hunt for a new restaurant, deciding together on the style of pizza (New York style, Chicago style, Detroit style), picking out the perfect toppings (lots o’ meat, savory garlic, something fancy-pants), and boxing up the leftovers. Valentine’s is not the only time we eat pizza, though, don’t you fret. Besides those bi-monthly-ish occasions when we splurge on a restaurant pie, every week or two, I make one from scratch. Sometimes I fail miserably – the crust isn’t cooked, I drop the whole pizza on the floor, the dough never rose. 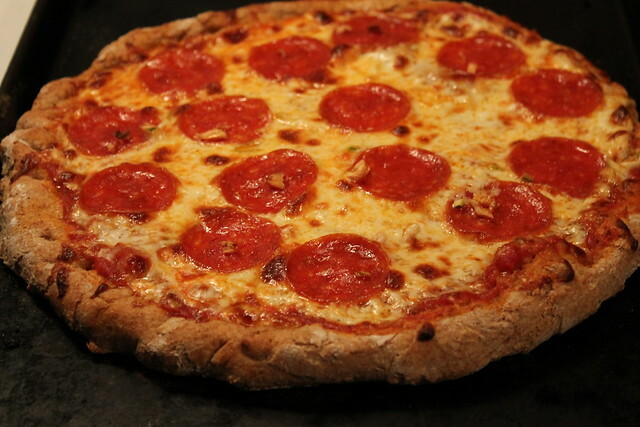 But most of the time, there’s crust, sauce, cheese pepperoni and garlic, and THAT makes us very happy. You know you want a bite! Don’t worry, Child, we’ll save some for you! I’m probably having Pizza for dinner tonight! There is a new Cell Phone Lot at the airport. which is set up like a rest area on the Toll Roads…. and it has a Pizza place called zPizza and I AM in LOVE with the pizza there! Sooo good! When I was there last week, I was telling the pizza guy how much I loved it and he gave me 2 coupons for a free slice of pizza!!! It’s soooo goood! and FREE is even better!